BUCKFIELD - With shattered hearts and unspeakable loss, we have to say goodbye to the most wonderful son, dad, fiancé, brother, nephew, and all of the other titles earned to Alexander William Pond during his short 24 years on this earth. BUCKFIELD – With shattered hearts and unspeakable loss, we have to say goodbye to the most wonderful son, dad, fiancé, brother, nephew, and all of the other titles earned to Alexander William Pond during his short 24 years on this earth. His heart was bigger than life. God and Missy gave him two beautiful daughters that he lived for every day, along with his loving soulmate and mother of their precious children. As a dad he was without fault. As a son and fiancé, along with all his other many roles he was a gift to us all that were fortunate enough to be part of his incredible life. Letting go is tearing the hearts from our chests. Alex was a very hard worker. He was a member of the Maine Carpenters Union #352.The best part of his day was arriving home in Buckfield to his girls, Missy, Ophielia Ray and Cecilia Irene. He was a mere three miles from home when he lost his life in a tragic automobile accident. 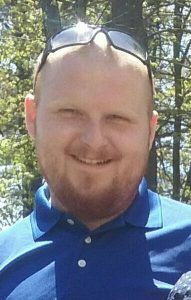 Alex leaves behind his fiancé of five years, Marissa Williamson of Buckfield; daughters, Ophielia, age 15 months and Cecilia, born Dec. 11, 2018; his adoring mom, Michele Witham and her husband, Travis of Buckfield; his father, Robert L. Pond of Wilton; paternal grandfather, Robert D. Pond of Mt. Vernon; a brother and best friend, Kyle Broad of Buckfield and younger brother, Corry Witham who adored his “Bubba”; sisters, Bobbi Jo Rollins and her husband, Jonathan, Amber Brown and her husband, Justin, Searah Pond, Brianna Tozier, Kate and Jenna Pond; his very own Aunt Cathy, Catherine Seely of Limerick; his uncle, Dana Lancaster; too many friends to mention now mourning his loss. He was predeceased by his “Gram” Irene Lancaster; his maternal grandfather, Leo Lancaster; uncle Stephen Lancaster; aunt “D” Marie Lancaster; his maternal grandmother, Louise Pond. Alex’s family wants to send special love and thanks to “Bumpa” and “Mammy” and the extended Witham family for being our “rock” in this difficult time. Also, Travis’ law enforcement brothers and sisters for their kindness and caring. A celebration of Alex’s life will be celebrated at 4 p.m., Tuesday, Jan. 22, 2019, at the Chandler Funeral Home & Cremation Service, 45 Main St., South Paris. A time of visitation will be held from 2 p.m., until the start of the service at 4 p.m. Condolences and tributes may be shared at www.chandlerfunerals.com.